Happy memories of our good times together. Will miss you. RIP. John, Ann, Paul, Leah and their families. The Funeral Service for the late Russell Kenneth Shadforth of Geraldton will be conducted at the Chapel of Peaceful Funeral Services, 1787 Albany Hwy, Kenwick on WEDNESDAY (3.4.2019) commencing at 10:00am. 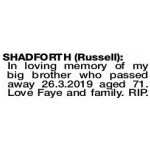 In loving memory of my big brother who passed away 26.3.2019 aged 71. Love Faye and family. RIP.